Every time you pick something up, instead of bending over, which puts stress on the lower back, keep your back straight, bend your knees and turn it into a squat. Such a simple exercise that works. Why? “It forces you to use leg muscles and builds strength,” says personal trainer Julie Brealy. Simple as that. Take a deep breath and, as you breathe out, engage your core and pelvic floor. Do this 10 times. Why? It sneaks in an abdominal and pelvic floor workout. Plus, your exhalation is forced to become longer, which oxygenates muscles and reduces stress. Lift one foot half an inch, keep your pelvis level, firm up your standing leg and push the grounded foot into the floor. Switch feet every minute or so. Why? “It helps firm the muscles in the legs and buttocks,” says Marc Kent, a personal trainer and founder of the Eat Smart Diet Solution. Do side leg raises. Stand on one leg and tighten your abdominal muscles. Keep your pelvis facing forward, lift one leg out to the side and bring it back. Do that 10 times and then switch. 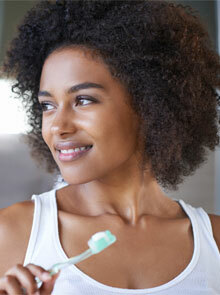 Continue until you finish brushing your teeth (which, incidentally, should take two minutes). Why? “It fires up the outer thigh muscles most of us want to tone,” says Julie Brealy. Keeping a straight back, contract your abdominal muscles and lift the bags from the trolley. As you hold one in each hand, perform five bicep curls. Keep your back straight, elbows close to your side and curl the bags up in a controlled movement until your hands are in line with your shoulders. Why? This upper arm exercise will strengthen core muscles as well as help shape the arms. Sit up straight, place a cushion or sponge ball between your knees and squeeze your thighs together. 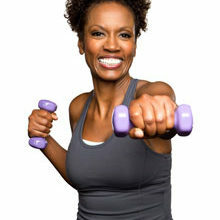 Hold for two or three seconds and repeat 20 to 30 times, rest and repeat up to10 times. Why? “It’s great for sleek, toned thighs,” says Richard Clarke, a personal trainer. While you’re talking, place a hand on your temple, then bend slowly, lowering your elbow to your hip and keeping the tummy tight and your shoulders back. Do 10 on each side, rest and repeat. Why? “It’s a great move that helps narrow the waistline,” says Julie Brealy. It may sound mad but that moment of privacy is an opportunity! Each time, bend your knee and grab hold of your left foot behind you, bringing it towards your bottom in a classic quadricep stretch. Hold for 10 seconds and then repeat on the other side. Why? “It will help your back. When you’re sitting down all day, it’s the contracting and tightening of the muscles of the legs that leads to ‘referred pain’ in the lower back,” says Marc Kent. Stand at the ironing board with your feet hip-width apart. “Keeping the shoulders apart, push up on to the balls of the feet, hold for a few seconds and come back down,” says Marc Kent. Do a minute of these, rest, then repeat five to 10 times. Why? “It gives you a nice burn in the calf muscles to tone and stretch,” says Marc. Sit upright and pull your belly button backwards towards the spine. Hold for a count of ten to 30 seconds, breathing gently – don’t hold your breath! Why? “It works your core abdominal muscles and helps to flatten tummies. Try to build up so you can hold it in for up to five minutes,” advises Richard Clarke.